Welcome back to Mr. McGaughey’s gifted class at Bayview public school. I had a lovely vacation with my family including a camping trip to the Rockies in Alberta. Seven students are returning to our class. Our timetable is greatly simplified from last year. The Junior students (Grade 5-6) will be in my classroom (room 128) from 8:55 am -12:05 pm then switch to Mrs. Parliament’s class 111 from 12:05-3:15pm. 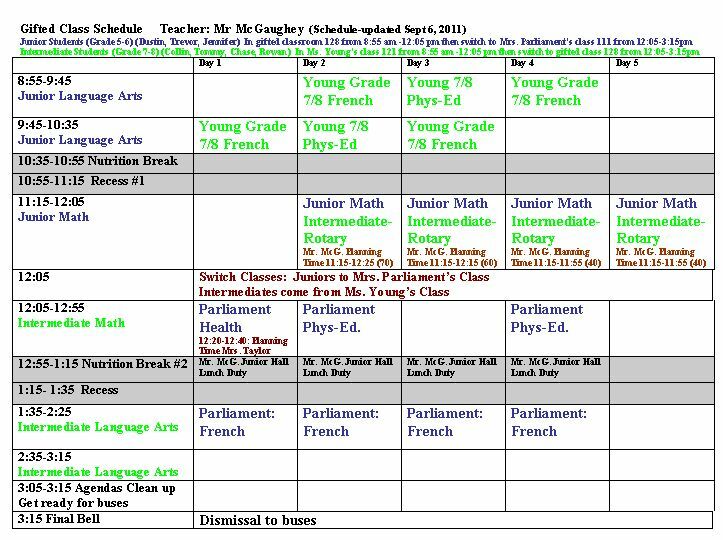 The Intermediate Students (Grade 7-8) will be in Ms. Young’s class 121 from 8:55 am -12:05 pm then switch to gifted class 128 from 12:05-3:15pm. Here is a complete schedule for our class. This may be subject to change over the next few weeks. You can click on the picture for a larger view. Newsletters and annual permission forms for walking trips, computer use, etc… will be going home this afternoon. As soon as all walking permission forms are in we will go for a class frisbee golf trip at Little Lake Park. Watch later this month for a full class newsletter of upcoming events. Miss Beausoleil has prepared a yummy special math, art, and language unit that we will be working on today. Sharing next week o as over, note or otter: Monday March 9: Amy, Makenzie. March 9: Report Cards go home. November 30: Report Cards go home. December 2,3: Student Involved Conferences: Check your Report Card Envelope for your appointment time. September 29: Picture Day- Remember to bring back your order envelope. October 8: Elmvale Fall Fair: Lunch at 11:15 (No Pizza). Parade starts at 12:00. On Tuesday September 21, we have the Terry Fox Run at our school. Terry Fox tried to run across Canada except he didn’t make it. He ran 40 to 50 kilometres each day. He stopped at Thunder Bay. Terry Fox wanted to raise money for cancer research. Posted in upcoming dates | Comments Off on Dates to Remember! Thursday May 12: Spring Picture Day. *Keep practicing telling time and counting coins.